Data Security is now more important than ever. Protecting your customer data is now being pushed to the forefront of how you are expected to protect your customers when visiting your websites or app. Any data (not just credit cards) must be protected for the sake of you and your customers. Also figured into this is how your website is ranked on Search Engines. Secure websites are now the preferred sites for search engines as they offer more protection to their visitors and provide a better user experience. Another element to consider is how internet browsers will flag websites that are not secure to warn users to the possibility of having their data stolen. Blueberry Design are now in position to offer customers a cost effective solution to this problem by installing SSL (Secure Socket Layering). SSL certificates secures data being sent from your website to another website or service (PayPal, Realex Payments, Mailchimp, etc) and also offers your customers piece of mind knowing their data is secure signifying this by the use of the Green Padlock which shows on ALL internet browsers. Our certificates are extremely secure and will offer your customers the protection they require. 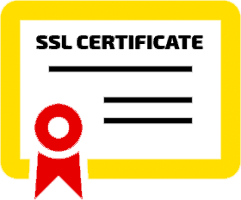 We supply a range of SSL certificates to suit all types of websites from small brochure sites to larger e-commerce websites.